A natural vibe that outdoor enthusiasts will really appreciate, these wedding invitations feature an elegent greenery design paired with a shimmering foil frame in your choice of three foil colors. The result is a peaceful presentation of natural elegance. 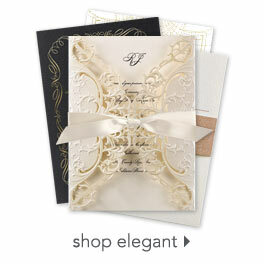 The back features a coordinating design with plenty of space for more wording like reception wording or accommodation details. Personalization Options: Leaf design prints as shown. Foil frame is printed in your choice of three foil colors. Wording is printed in your choice of colors and fonts.